UCC President, Prof. Patrick O'Shea, presents Alan with his Career Achievement Research Award. 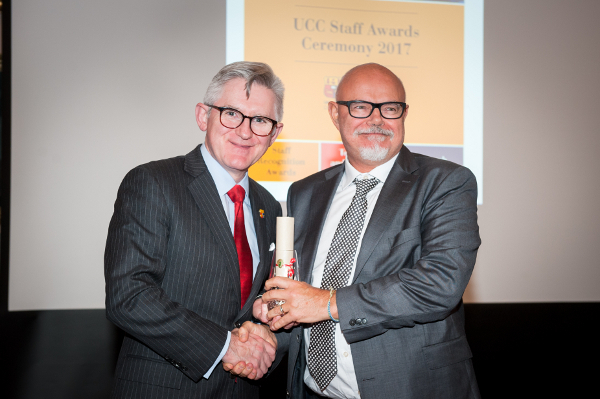 CONNECT Deputy Director Dr Alan Mathewson has received University College Cork‘s Career Achievement Research Award for ‘the most outstanding overall performance by a researcher’. Alan is also Deputy Head of the Micro-Nano Systems Centre at Tyndall National Institute. Congratulating Alan, Professor Linda Doyle, Director of CONNECT, said: “Alan is a fantastic researcher and his record speaks for itself. But he is also a warm, generous and open person and this has given his work even greater impact. Alan joined UCC in 1982 as a Research Scientist in the fledgling NMRC (National Microelectronics Research Centre) which became the Tyndall National Institute in 2005. In the intervening 35 years, he played a leading role in establishing UCC and Tyndall as a global leader in microelectronics research excellence, training and education. His research output and his graduate students have had a major impact on the development of the microelectronics industry in Ireland and worldwide. It continued: ‘Working in Ireland in the 1980s and 1990s, he established a major research activity (at a time when there was virtually no national research funding support) which made ground‐breaking contributions across a range of related microelectronics research problems. ‘At a technological level, he demonstrated, in 1989, the first ever 3D integrated circuit (stepper motor controller) using electron beam recrystallization and zone melting recrystallization technologies to create the upper recrystalised layer, opening a research field that is of critical importance, and where his ongoing contributions continue to be highly regarded. ‘Over the years, his experimental work has been strongly underpinned by an excellent theoretical understanding. His device modeling research has transformed the global microelectronics CAD and T‐CAD communities in the mid‐to late 1990s and has had a major influence on CAD platforms developed by key industry players including Silvaco and Cadence. ‘Most recently, he has extended his interests to the use of AlN‐based piezoelectric materials for energy harvesting. His team has achieved world‐leading figures‐of‐merit for energy harvesting applications and the technology has been transferred to Analog Devices European Microsystems Fabrication Facility in Limerick, as well as being the subject of keynote speeches at two international conferences.